I love foods wrapped in fun little packages. Don’t you? When creating my last gluten-free lentil recipe for the US Dry Pea and Lentil Council I kept going back to grape leaves. Lentils and grape leaves seem like they are made for one another, yet I had never seen a recipe for lentil stuffed grape leaves. Solution? I created it myself! This recipe can be tweaked to contain your favorite foods. It is perfect for summer picnics as it travels well! Follow the tutorial in this post using the ingredients listed above. Exclude the lemon juice. Serve at room temperature with your favorite salad. Enjoy! *NOTE: I have the opportunity to win a swanky Le Creuset set by having the most comments on this post. Please do me a solid and leave me a comment! OH! And the first 500 voters (your comment is a vote for me) who email their mailing address to peasnlentils@edelman.com will receive free dry lentil and pea samples from the US Dry Pea & Lentil Council! 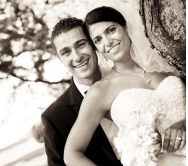 PS- I shared a funny hormone-driven story on Babycenter today. Check it out! Yummmm! Those look amazing – I will definitely have to try them…never thought of lentils in grape leaves before. Good idea, Sabrina! I hope you win! Pssss, lovin’ the pregnancy posts. Congraulations! You look beautiful and so happy! Just found your blog through Momformation and since going semi-vegan (don’t ask) am always looking for tasty, healthy recipes (and free give-aways!) Will definitely try these very soon. 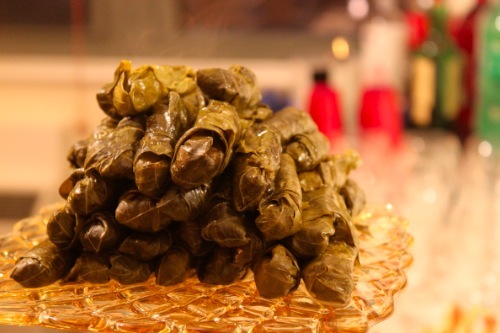 I Love stuffed grape leaves, but I’ve never thought about making them! They are usually a nice ‘treat’ from the Earthfare hot bar! I will have to try making them now that I have a recipe, thanks! Hi there, I discovered your website via Google while looking for a similar topic, your website got here up, it looks good. Hi there, just become aware of your blog thru Google, and located that it is really informative. I am going to be careful for brussels. I will be grateful should you proceed this in future. Lots of folks shall be benefited from your writing. Cheers!